South Bangla Agriculture and Commerce Bank Limited SBAC published New job vacancy Notice at www.sbacbank.com. South Bangla Agriculture and Commerce Bank Limited SBAC Bank Job Circular offer New vacancy in this post. 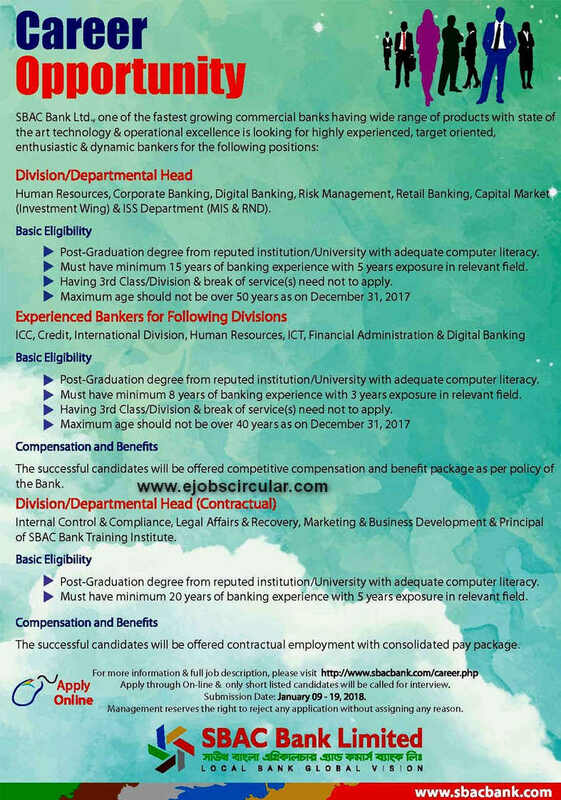 Graduate Student also apply this South Bangla Agriculture and Commerce Bank Limited SBAC Bank circular 2018. Must have minimum 8 years of banking experience with 3 years exposure in relevant eld. Having 3rd Class/Division & break of service(s) need not to apply. Compensation and Benefits: The successful candidates will be offered contractual employment with consolidated pay package. Post-Graduation degree from reputed institution/University with adequate computer literacy. Apply through On-line & only short listed candidates will be called for interview. Management reserves the right to reject any application without assigning any reason. If You want to apply South Bangla Agriculture and Commerce Bank Limited SBAC Bank job circular through online you have to visit there official website. For Next Updates about South Bangla Agriculture and Commerce Bank Limited SBAC Bank Job Circular Vacancy Notice,Exam Result or Admit card Download stay with us. This entry was posted in Bank Career, Graduate Jobs and tagged bank jobs by Raju Ahmed. Bookmark the permalink.